Richard Buggs is interested in the mechanisms of evolution. How do new species originate? How are they maintained? What causes them to go extinct? Ash trees in Britain, Europe and North America are threatened by ash dieback and the emerald ash borer. We are using phylogenomic approaches to find genetic variants in ash species that reduce their susceptibility to these two health problems. We have sequenced the genome of a British ash tree (Fraxinus excelsior) with funding from NERC. Postdoc Laura Kelly is now sequencing the genomes of 35 other ash species from around the world, funded by the BBSRC, Defra, NERC, ESRC, Scottish Government and Forestry Commission. We are screening different ash species for susceptibility to ash dieback and the emerald ash borer, in collaboration with Forest Research (Roslin) and the United States Forest Service (Ohio). We will seek gene trees that have a topology matching the pattern of susceptibility of the species to each health problem. More details may be found on the project website www.ashgenome.org. (2) Birch trees on Scottish mountains. Dwarf Birch is rare and found mainly above the tree line, whereas Downy Birch is widespread below the tree line. The two species hybridise a great deal. We are using new DNA sequencing methods to work out how the two species maintain their identity in the face of hybridization, and the extent to which hybridization impedes the conservation of dwarf birch. We are especially interested in how global warming affects the dynamics of this system. This work is funded by a Fellowship from the Natural Environment Research Council. We have recently sequenced the whole genome of Betula nana. More details may be found on the project website www.birchgenome.org. (3) Hybridisation of Tragopogon species (Daisy family) in south-east England. We are studying diploid hybridisation between Tragopogon pratensis and T. porrifolius, which results in T. x mirabilis. We have found abundant hybrids in natural mixed populations in London and have preliminary evidence that they are reproducing. This work is funded by a pump-priming SYNTAX grant in collaboration with Andrew and Ilia Leitch. Richard was previously a post-doctoral research associate at the University of Florida, in the lab of Doug and Pam Soltis examining the evolutionary genetics of plant species with different numbers of chromosome sets. He studied the rapid loss and silencing of genes after natural whole genome duplication events. 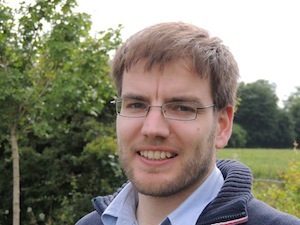 He holds a DPhil from the University of Oxford for a doctoral thesis on the evolutionary ecology of two closely-related plant species. He received his undergraduate education at the University of Cambridge, where he was elected Bateman Scholar at Trinity Hall, and gained a first class Bachelor’s degree in Natural Sciences.